93 Years Since Alan Ladd Was Born! This is to put readers on notice that there will be a further (and more detailed) posting on Alan Ladd in the weeks to come, for no reason other than the fact that I consider him one of the great screen personalities --- an all-purpose definition of what being a movie star is all about. For the meantime, here’s a shot of Ladd in his most famous role to commemorate the ninety-third anniversary of his birth. 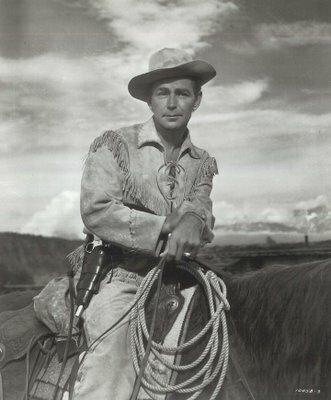 So few of his films have been released on DVD --- Shane, This Gun For Hire, Whispering Smith, Branded, The Proud Rebel. The Carpetbaggers. Universal owns most of them now. A box set would be a welcome thing indeed. Copyright records indicate that Ladd’s family still owns a few titles, including Drum Beat and one of my favorites, Hell On Frisco Bay. Both of these are in Cinemascope, and I’d hope that some enterprising distributor would make an arrangement with the estate to release them. They may not be Hondo and The High and The Mighty, but they’ve been out of circulation almost as long, and I for one would love to see them again. Nice to see the picture from Shane as I just watched it again last night. He did have a quality about him..I just wished he had made more films as good as Shane. I think Alan Ladd himself would probably agree with Greg in wishing that there had been more movies like Shane. I remember reading an interview with Robert Preston years ago in which the interviewer asked him if there were any stars he remembered from his early days who never quite got the careers their talent deserved, and Preston mentioned Ladd. I can't quote him exactly, but he said something to the effect that Ladd had found his first success as a radio actor, and that "you had to be good to succeed in radio." After Ladd's starmaking splash in This Gun for Hire, Preston said, Ladd's wife and agent Sue Carol made him take a succession of hardboiled roles that suited neither his physique nor his temperament, and Ladd became increasingly miserable as his career went along. The one exception, in fact, was Shane -- Preston said he never saw Alan happier, before or after, than he was when he was making that one. I'm just curious how to interpret the copyright records to find out that Ladd’s family owns Drum Beat. Did you deduce that from RE-143-248 and/or RE-144-509?